Here are some wedding cake ideas to consider. When you`re getting married, there are a number of important decisions to make in order to make sure the big event is perfect. One of those decisions centers on the special cake you are going to serve. A wedding cake is often the centerpiece of the reception; it makes a dramatic statement on a table all by itself and the bride and groom feed each other a piece in the classic time-honored tradition. 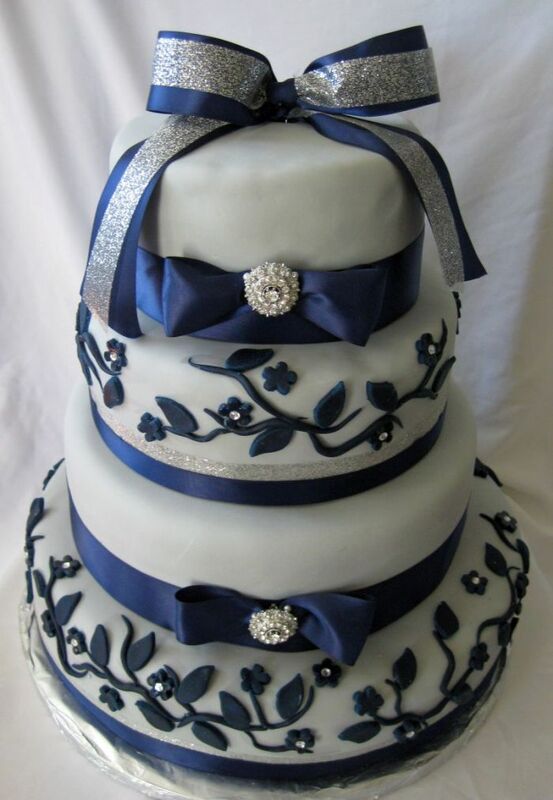 A piece a cake or the cake`s top tier is also traditionally kept and consumed on the couple`s anniversary or at the christening of their first child. 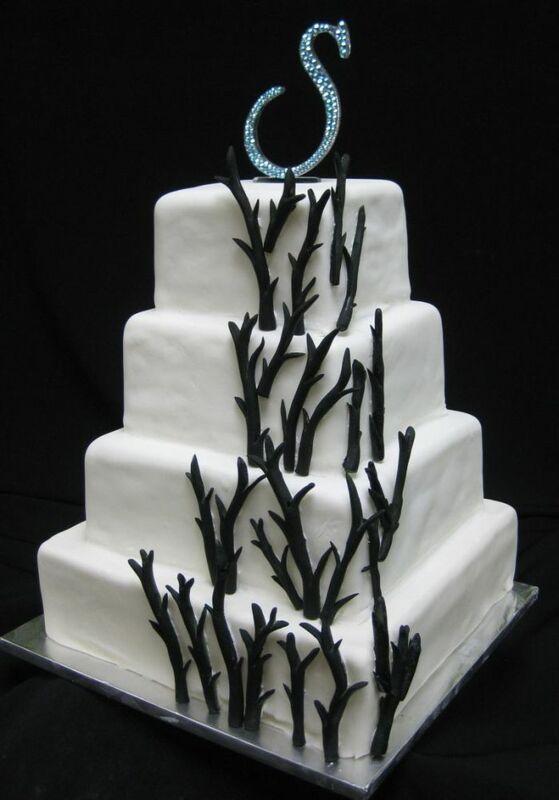 Because the cake is such a strong part of the wedding tradition, it`s important to make the right choice. A traditional wedding cake is a two tiered or three tiered cake with white frosting and a little statue of the bride and groom cake topper. The cake might be vanilla or chocolate or a mixture of several cake flavors, with some people doing many flavors so that everyone gets the type of cake that they like best. The cake might also have a mousse or fruit filling inside. Cakes may be elaborately decorated, with beautiful flowers, roses and other embellishments made from icing or marshmallow fondant. Typically, the more elaborate the decoration on the wedding cake, the greater the cost of the cake will be. Some exquisite wedding cake ideas can cost in the thousands of dollars, so we work with you to balance your budget and your desire for the perfect cake. 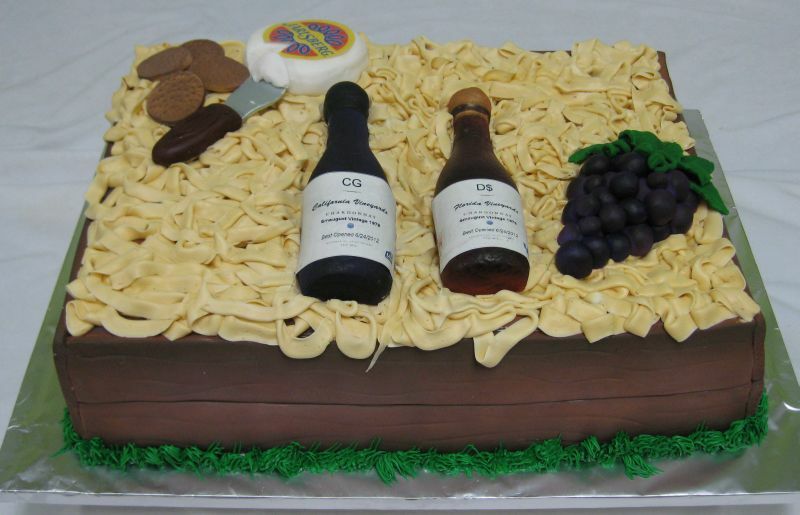 See our special Cake Pricing Here! Today, some people are considering alternatives to the traditional formal wedding cake, especially as people explore more casual weddings. One fun alternative is a cupcake wedding cake idea with a top cutting cake instead of a tiered wedding cake. This capitalizes on the new cupcake craze made popular by luxury cupcake shops. Another advantage is cost. 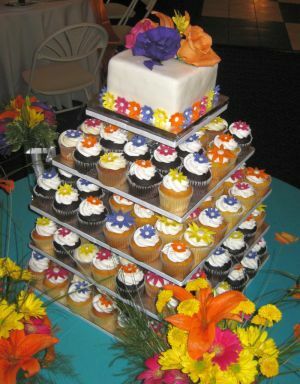 Typically a nice wedding cupcake presentation is about fifty percent less than a tiered wedding cake. Add a top cutting cake to your design and get the look of a tiered wedding cake without the cost. 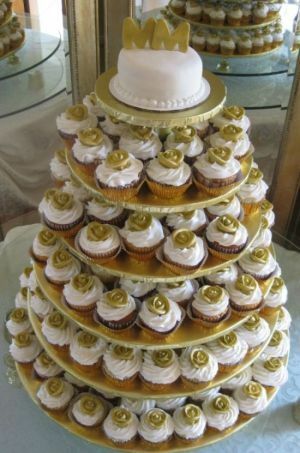 The wedding cupcake idea, like the cake, can be decorated in an elaborate fashion or can be simple, depending on the style of your wedding event. Cupcakes also give you the opportunity to have a variety of different flavors to accommodate the desires of all of your guests. There are literally countless options in terms of flavor and style of wedding cake or traditional vs. modern wedding cake ideas, so your best option is to browse through photographs of cakes in bridal magazines to find the one that best meets your needs. The Internet image search is also a great source of information about wedding cakes and you can see pictures of the newest styles. Whatever you choose, remember that wedding cakes need to be ordered well in advance and sometimes as much as three months in advance in order for it to be ready for the big day. This means you should plan ahead. 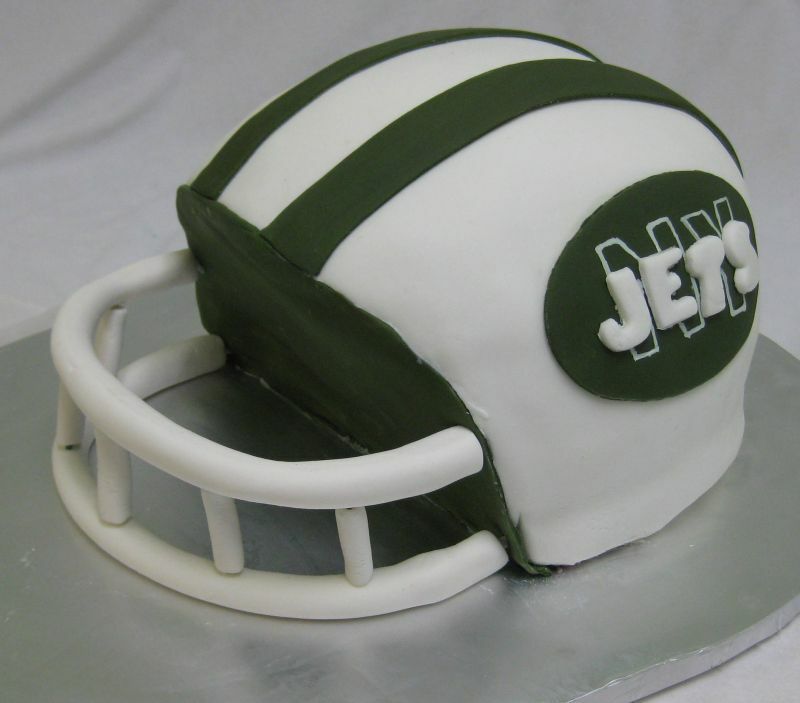 Don`t wait until the last minute to place your cake order, unless you want to get stuck with a generic sheet cake from the bakery for your big event. Other wedding cake ideas to consider are the groom's cake and the rehearsal dinner cake. This wine theme rehearsal dinner cake idea had custom wine labels for the bride and groom with the vintage to match their wedding date. Match the groom's cake to his passion for the perfect cake idea. This grooms cake idea was his favorite football team. 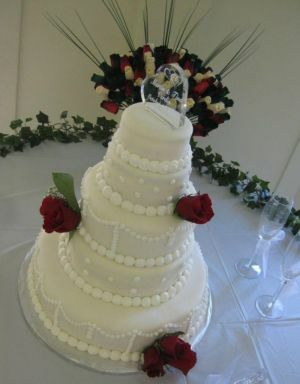 Some people also try to make their own wedding cake in order to make it more personal, or to save money. If you decide to make your own wedding cake we offer a free online resource to help you prepare.